President Obama threw out his shoulder on Sunday at the 19th Street Baptist Church while reaching across the aisle to shake hands with Senate Republican Olympia Snowe, who was also in attendance. Just one day after Congress passed the $787 billion stimulus package, the ill-fated gesture was intended to be an act of post-partisan solidarity. "The president was seated in an aisle pew on the left-hand side of the church," one eyewitness explained. "Senator Snowe was on the right flipping through her hymnal. He stuck his arm out into the aisle to shake hands with the Senator. And then I saw him grab his shoulder. He looked like he was in a great deal of pain." Dr. Glenn Stevens, an orthopedic surgeon who treated the president at George Washington University Hospital this afternoon confirmed that the president's shoulder was dislocated in the accident, speculating that it had suffered extreme duress from repeated attempts at bipartisanship. "His condition is similar to tennis elbow or carpal tunnel, only the repetitive motion of reaching across the aisle appears to have weakened the ligaments in his shoulder," said Stevens. 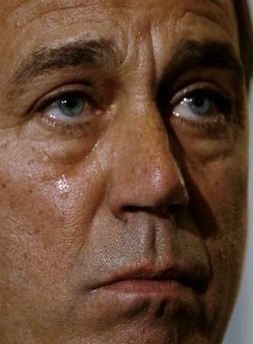 Also injured in the accident was House Minority Leader John Boehner. The Congressman stumbled over the wooden base of a pew, as he attempted to make his way to his seat. According to sources, Boehner was trying to avoid the president's outstretched limbs as he fell to the ground, crushing his mascara wand in the fall. "With all due respect to the president, he shouldn't have his arms and feet blocking the aisle," said Boehner, who sustained minor injuries. "Everyone knows he's lanky." "If you ask me," Boehner continued, "this liberal concept of reaching across the aisle is dangerous. We need to keep those aisles clear. What if there was a fire and people needed a clear passage to the exits? We need to refocus our energies on tax cuts, not liberal spending and aisle-reaching." One of only three Republicans who voted "yes"on the much-criticized stimulus package, Sen. Snowe was more sympathetic to Obama's thwarted gesture. "Clearly, I applaud the president's attempts to reach across the aisle. But I do think others in my party are frightened by the idea of being touched by Reid or Pelosi. Personally, I keep a bottle of Purel in my bag. You know, in case they should decide to reach across and put their hands on me." This wasn't Obama's first aisle-related mishap. Last week, his administration faced a major setback when New Hampshire Republican, Sen. Judd Gregg, announced that he would be withdrawing his nomination as Commerce secretary. Citing "irresolvable conflicts," Gregg insisted that Obama needs to reach out further if post-partisanship is to be achieved.
" There are simply no aisles in the Oval Office" explained Gregg on Meet the Press. "And, unfortunately, that's where the president and I conducted most of our business. He did reach across his desk once or twice to shake my hand, but we were essentially standing right next to each other," said Gregg. Like a growing number of GOP lawmakers, Gregg has criticized the president's efforts at post-partisanship as inflated rhetoric. "When he reached over to me across the desk, his arm was bent at the elbow," said Gregg with obvious irritation. "If Obama really respected my point of view, his arm would have been fully extended, preferably across some type of passageway separating opposing rows of chairs." Gregg refused to vote on the stimulus package, one of many signs that Congress is a long way from achieving the post-partisanship Obama hopes to bring to fruition. 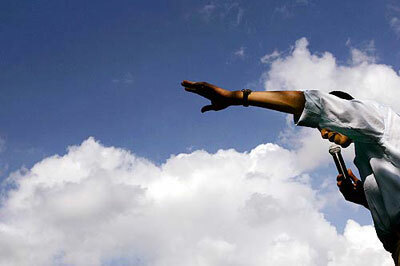 "I screwed up" said Obama in response to Gregg's statements. "Let's be clear. We're in the process of setting up folding chairs in the Oval Office. I fully intend to reach across the aisle we create as soon as I recover from this morning's injury. 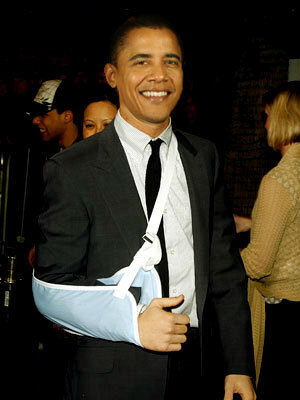 I should be out of this sling in a couple of weeks." But according to many critics of the administration, putting an aisle in the Oval Office may not even be possible. "Look, the Oval Office just isn't big enough for an aisle," said Joe Scarborough on MSNBC. "At best you can throw in a few rows of chairs in there. It isn't big enough, it just isn't big enough!" Experts agree that Scarborough may have a point. As traditionally defined an aisle is a "long space" often separating a group of chairs. According to most definitions "an open space with three rows of chairs to the right and three to the left generally would not be considered an 'aisle.'" "This hot air about aisles in the White House," said Scarborough, "is just further proof that Obama is not willing to compromise. It's simply more eloquent rhetoric." Republican Senator Tom Coburn, known for his conservative evangelical views, voiced other concerns. "All this talk about reach arounds in the aisles of Congress just sounds lewd. I don't know how they do things in Chicago, but it just doesn't sound right to me." When informed that the metaphor being used by the president was "reach across" not "reach around," Coburn's opinion remained consistent. "Call me old fashioned,"said Coburn,"but my mother always told me that reaching across people is rude. You should wait your turn. That's the thing... liberals are always reaching and grabbing. My advice to Americans in these liberal, touchy-feely, reachy-grabby times is this: hold onto your wallet." As Obama recovers from his dislocated shoulder, he's pledged to continue moving forward, not allowing the setback to weaken his resolve. "We must bridge the partisan gap that persists in Washington" said Obama. As part of an ambitious public works initiative, the administration has announced plans to oversee the construction of millions of new aisles all across America. "The legitimate object of government," said Obama paraphrasing Lincoln, "is to do for the people what they cannot do by themselves." "Why should supermarkets, churches, movie theaters, and legislative buildings be the only places you find aisles in this country? As president I will see to it that every home in America has an aisle to reach across. The construction of these aisles will stimulate the economy by creating new jobs. But more importantly, a New Post-Partisan Great Society will emerge as parents and children, friends and neighbors, and yes Democrats and Republicans learn to reach across the aisles in the comfort of their own homes." When asked about the president's ambitious aisle-building initiative, conservative talk show host Rush Limbaugh had misgivings. "I hope he fails," said Limbaugh. "I liken it to the old analogy that you can't yell 'fire' in a crowded movie theater," continued Limbaugh. "Our economy is crashing and burning. It's on fire. The last thing we need is a bunch of arms dangling about in new aisles—aisles we can't even afford for that matter—as economically-strapped Americans try to make it to safety."